Anglo-Indian Demilune pedestal table, circa 1900's. 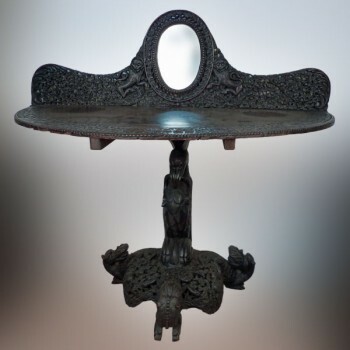 48" x 25" x 44½"
Anglo-Indian Demilune pedestal table with three headed serpent design footed base, intricate deep carved relief detail of scrolling ivy, flying birds and an oval bevel edged mirror flanked with two rearing lions. Early 20th century. Forty eight inches wide x twenty-five deep x forty-four high.